PRM Waste Systems supply a range of pelletisers capable of dealing with a variety of raw material, offering pellets for different uses. Designed specifically for Biogas plants, the digestate pelleting line produces pellets for use as a natural fertilizer. The pelleting line is equipped with a dryer (belt or drum type), hammer mill, pellet mill, cooler, sifter and dust filter. The plant can be run in automatic or manual mode. The available capacities start at 200kg/h up to 2000kg/h. It is possible to blend the digestate with other components for better properties. This is a great way to add value to your waste! Do you have your own raw material but not enough for high industrial capacity for a full pelleting line? Then take a look at the Mini Pelleting Line. We have machines tailored for any kind of raw material; animal feed, biomass, biogas plant digestate, fertilizers etc. The small scale technology is designed for low capacity users. With the Mini Pelletiser you can start small and expand with additional equipment such as the pellet cooler, pellet cleaner, packaging machine etc. you may easily double the capacity or increase functionality. 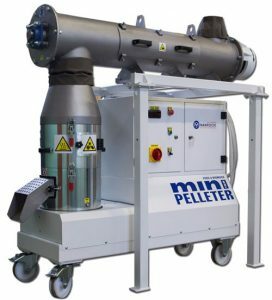 Start and grow with the Mini Pelletiser. If you don’t plan to invest in infrastructure then our Containerised Mini Pelleting Line may be the answer. We can deliver the full technology including all machines, subsystems and wiring in just a couple of containers. And with fully automatic work control you will only need one or two operators per shift. Get the maximum output with minimum input.